But renewables still face major obstacles. Some are inherent with all new technologies; others are the result of a skewed regulatory framework and marketplace. This page explores the barriers to renewable energy in detail, with a focus on wind and solar. For more on why renewable energy is so important, please see our page on the Benefits of Renewable Energy Use. The most obvious and widely publicized barrier to renewable energy is cost—specifically, capital costs, or the upfront expense of building and installing solar and wind farms. Like most renewables, solar and wind are exceedingly cheap to operate—their “fuel” is free, and maintenance is minimal—so the bulk of the expense comes from building the technology. The average cost in 2017 to install solar systems ranged from a little over $2,000 per kilowatt (kilowatts are a measure of power capacity) for large-scale systems to almost $3,700 for residential systems. A new natural gas plant might have costs around $1,000/kW. Wind comes in around $1,200 to $1,700/kw. Higher construction costs might make financial institutions more likely to perceive renewables as risky, lending money at higher rates and making it harder for utilities or developers to justify the investment. For natural gas and other fossil fuel power plants, the cost of fuel may be passed onto the consumer, lowering the risk associated with the initial investment (though increasing the risk of erratic electric bills). However, if costs over the lifespan of energy projects are taken into account, wind and utility-scale solar can be the least expensive energy generating sources, according to asset management company Lazard. As of 2017, the cost (before tax credits that would further drop the costs) of wind power was $30-60 per megawatt-hour (a measure of energy), and large-scale solar cost $43-53/MWh. For comparison: energy from the most efficient type of natural gas plants cost $42-78/MWh; coal power cost at least $60/MWh. Even more encouragingly, renewable energy capital costs have fallen dramatically since the early 2000s, and will likely continue to do so. For example: between 2006 and 2016, the average value of photovoltaic modules themselves plummeted from $3.50/watt $0.72/watt—an 80 percent decrease in only 10 years. 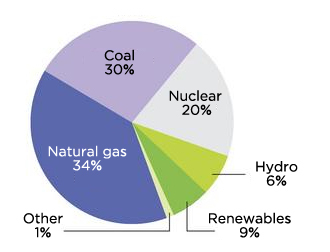 Nuclear power, coal, and natural gas are all highly centralized sources of power, meaning they rely on relatively few high output power plants. Wind and solar, on the other hand, offer a decentralized model, in which smaller generating stations, spread across a large area, work together to provide power. Decentralization offers a few key advantages (including, importantly, grid resilience), but it also presents barriers: siting and transmission. Siting is the need to locate things like wind turbines and solar farms on pieces of land. Doing so requires negotiations, contracts, permits, and community relations, all of which can increase costs and delay or kill projects. Transmission refers to the power lines and infrastructure needed to move electricity from where it’s generated to where it’s consumed. Because wind and solar are relative newcomers, most of what exists today was built to serve large fossil fuel and nuclear power plants. But wind and solar farms aren’t all sited near old nuclear or fossil fuel power plants (in fact, some areas with fewer older power plants, such as the Great Plains and Southwest, offer some of the country’s best renewable potential). To adequately take advantage of these resources, new transmission infrastructure is needed—and transmission costs money, and needs to be sited. Both the financing and the siting can be significant barriers for developers and customers, even when they’re eager for more renewables—though, again, clean energy momentum is making this calculation easier. For most of the last century US electricity was dominated by certain major players, including coal, nuclear, and, most recently, natural gas. Utilities across the country have invested heavily in these technologies, which are very mature and well understood, and which hold enormous market power. This situation—the well-established nature of existing technologies—presents a formidable barrier for renewable energy. Solar, wind, and other renewable resources need to compete with wealthier industries that benefit from existing infrastructure, expertise, and policy. It’s a difficult market to enter. New energy technologies—startups—face even larger barriers. They compete with major market players like coal and gas, and with proven, low-cost solar and wind technologies. To prove their worth, they must demonstrate scale: most investors want large quantities of energy, ideally at times when wind and solar aren’t available. That’s difficult to accomplish, and a major reason why new technologies suffer high rates of failure. Increased government investment in clean energy—in the form of subsidies, loan assistance, and research and development—would help. You don’t tend to see multi-billion dollar industries without also seeing outsized political influence—and the fossil fuel industry is no exception. Oil Change International estimates that the United States spends $37.5 billion on subsidies for fossil fuels every year. Through direct subsidies, tax breaks, and other incentives and loopholes, US taxpayers help fund the industry’s research and development, mining, drilling, and electricity generation. While subsidies have likely increased domestic production, they’ve also diverted capital from more productive activities (such as energy efficiency) and constrained the growth of renewable energy (solar and wind enjoy fewer subsidies and, generally, receive much less preferential political treatment). For decades, the fossil fuel industry has used its influence to spread false or misleading information about climate change—a strong motivation for choosing low-carbon energy sources like wind or solar (in addition to the economic reasons). Industry leaders knew about the risks of global warming as early as the 1970s, but recognized that dealing with global warming meant using fewer fossil fuels. They went on to finance—and continue to fund—climate disinformation campaigns, aimed at sewing doubt about climate change and renewable energy. Their efforts were successful. Despite widespread scientific consensus, climate action is now a partisan issue in the US congress, complicating efforts to move from fossil fuels to clean energy. The disconnect between science and policy means that the price we pay for coal and gas isn’t representative of the true cost of fossil fuels (ie, it doesn’t reflect the enormous costs of global warming and other externalities). This in turn means that renewables aren’t entering an equal playing field: they’re competing with industries that we subsidize both directly (via government incentives) and indirectly (by not punishing polluters). Emission fees or caps on total pollution, potentially with tradable emission permits, are examples of ways we could use to help remove this barrier. Renewable energy opponents love to highlight the variability of the sun and wind as a way of bolstering support for coal, gas, and nuclear plants, which can more easily operate on-demand or provide “baseload” (continuous) power. The argument is used to undermine large investments in renewable energy, presenting a rhetorical barrier to higher rates of wind and solar adoption. Tests performed in California, which has some of the highest rates of renewable electricity use in the world, provide real-world validation for the idea that solar and wind can actually enhance grid reliability. A 2017 Department of Energy report confirmed this, citing real-world experience and multiple scientific studies to confirm that the United States can safely and reliably operate the electric grid with high levels of renewables. Many utilities, though, still don’t consider the full value of wind, solar, and other renewable sources. Energy planners often consider narrow cost parameters, and miss the big-picture, long-term opportunities that renewables offer. Increased awareness—and a willingness to move beyond the reliability myth—is sorely needed. Renewables are cheap to operate, but can be expensive to build. Selecting an appropriate site for renewables can be challenging. US electricity sources, 2016. Renewables face stiff competition from more established, higher-carbon sectors. Climate action opponents like EPA administrator Scott Pruitt have long been propped up by industry money. When done correctly, reliability isn't a concern with wind and solar—it's actually a strength.